As an effort to keep consumers purchasing the standard point-and-shoot, we have seen a great insurgence of more high-end digital cameras. These are a great option for photographers looking to increase the quality of their photos without breaking their budget. But can they really compete with the quality of a DSLR? Let's find out in this head-to-head battle. An SLR offers superb lens versatility. Most manufacturers offer at least 40 digital camera lenses, allowing you to accurately target and compose your shot. The disadvantage? The pentraprism we talked about last week isn't light as a feather. SLRs are much bulkier, and so are many of their accessories. However, most entry-level models are lighter than their more expensive counterparts. One cannot doubt the increased image quality of an SLR. 10 megapixels on an SLR is better than 10 megapixels on a digicam. It's even more apparent at higher light sensitivities. With better quality, though, comes more complexity. For some, it's a welcomed lesson, while for others it's a confusing chore. The performance of an SLR cannot be beat. 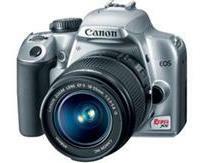 They have a faster autofocus, shorter shutter delay, continuous shooting, and more memory. And all that comes at a higher price. But cheaper SLRs are now about the same price as high-end point-and-shoots. The digital SLR doesn't just come with great lens choices, they also have a host of accessories to improve quality, including external flashes, wireless transmitters, remote triggering, and more. With an SLR, more is, well, more! If more sounds good to you, then opt for the SLR.